I remember quite clearly when Jeff Oster burst onto the New Age music scene in 2005, with his blazing trumpet and mellow flugelhorn. I remember well, because the incredibly dynamic, vibrant music on his award-winning debut album, “Released,” was instrumental in changing and redefining the landscape of the way we perceive New Age music today. Hence, “New Age music” morphed more into “zone music.” Jeff’s music was groundbreaking in this genre. And still is. Now, after more than a decade of more albums, more awards, more acclaim – four-time Zone Music Reporter “Album of the Year” winner, with numerous #1 charting songs on NPR’s “Echoes” program, and two Independent Music Award wins for “Best New Age Song,” plus a Top 5 Billboard charting album with the super-group FLOW – where does one go from there? Can a person “best” themselves? I think if anyone can do so, it’s Jeff Oster, who consistently raises the bar, not only for himself as a musician, but for an entire musical genre. So, it comes as no surprise that his new album, “Reach,” in my opinion, is his best work yet. “Reach” is 9 tracks and 44 minutes of divine chill with a jazz/world-fusion groove. It’s Jeff Oster. AV: What was it about music that drew you to it at the beginning? What did it bring to your life that wouldn’t be there without music? My horn was what made me different, what got me noticed, what got me accepted. Always being the “new kid” wasn’t easy. I remember when I was in sixth grade – in Framingham, MA. I had just moved there, and I brought my horn to school – and played Silver Bells that winter. I realized that no matter how “different” I was – the music that came out of my horn was understood and accepted. That remains true today. And tomorrow. and ambient, Oster exceeds his grasp and he never loses sight of the final destination. Is there such a thing as ambient jazz? Yes, there is. 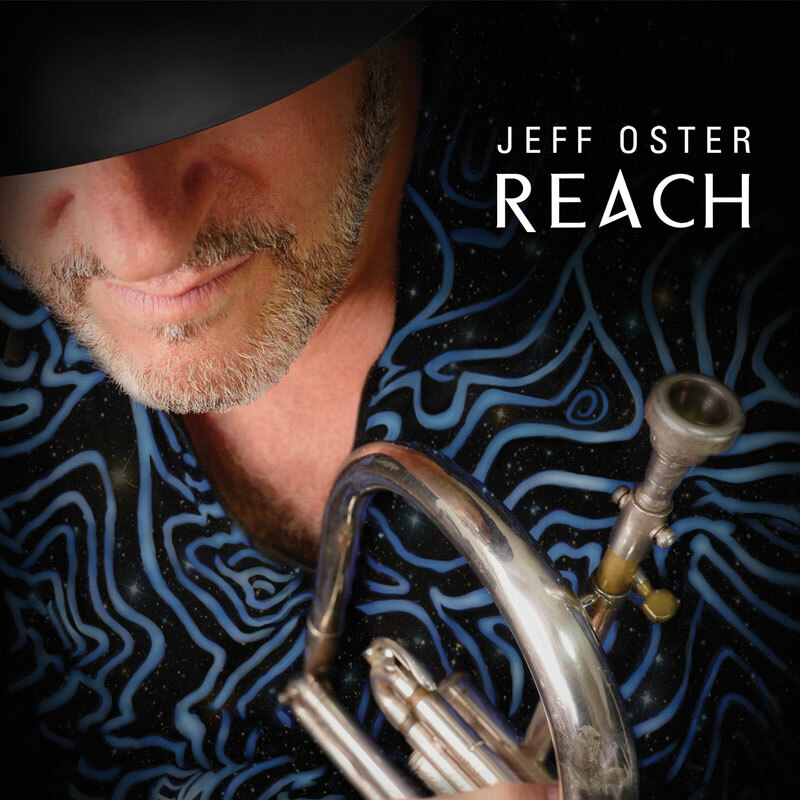 Example; horn player Jeff Oster’s latest album Reach. Several years back Oster found the alchemy that it takes to make a simple horn theme echo and endlessly reverberate within a song and add to the melody without heavy handedness or taking over the lead, unless of course, he is the lead. Three years ago, I covered Jeff Oster’s Next album. If you do a search on my New Age Music Reviews site it will show several other artist reviews as well. The reason is that Jeff is in demand to play on other people’s albums. There is a very good reason for this. He is one of the few Flugelhorn and Trumpet players in the genre that plays a chill ambient type of music that new age recording artists and listeners alike want to hear. He also is able to interject jazz and funk elements into his recordings. Besides that, it is a great partnership. Jeff is masterful with his instruments and with the new album out now titled Reach, he is in great form and so are the folks that accompanied him on the album. Jeff Oster brings his singular blend of new age, jazz, ambient and groove to virtually every project he leads. That doesn’t mean he won’t bring something new to the table to give followers of this trumpet and flugelhorn maestro something new to look forward to. For Reach (October 5, 2018), that secret weapon is Mr. Ruslan Sirota, a Grammy-winning pianist and composer who is probably best known as a long time member and collaborator in Stanley Clarke’s band. Sirota is a major figure on Reach, lending not only keys, vocals and other instruments, but also co-composing the tunes with Oster and producing the whole danged thing. That might suggest that Reach should have been co-credited to him, but Sirota’s big footprint makes this no less a Jeff Oster album. The best part about his involvement is he uses his talents to accentuate, not overtake, Oster. The formula here remains a familiar one, it’s Oster’s just-right mixture of the smooth, ethereal, exotic and groove-laden, with a world fusion twist thrown in here and there for good measure. It sounds just a little more refined, now. The distant, frame drums and softly tinkling piano provide the right context on “Onward” for Oster’s celestially floating flugelhorn. Oster’s horn resonance “Far Rockaway” leads a dreamy soundscape but Sirota’s piano takes a pretty turn on piano for the brightest spot of the song. The ‘groove’ part of Oster’s repertoire gets going with “Le Caveau,” but interestingly, not with such obvious tactics such as a finger popping bass or a heaping help of synths but rather a core pulse consisting of Benjamin J. Shepherd’s standup bass, Robyn Ghosh’s acoustic guitar and Tamir Barzilay’s rollicking drums. “Five Great Mountains” also has a good beat going but features echoes of India thanks to Jenni Asher’s erhu and Pete Korpela’s tabla. Introspection returns with “The Lotus Within,” a repeating figure with a cadence Barzilay carefully modulates without fanfare with his drums. “Troppo y Boffo” is a blissful mixture of old and new: a rich, flamenco-styled chord progression pushed by a bass ‘n’ drums pulse. And Oster just glides between these two worlds like there are no fences between them. “How Familiar” opens with a blossoming of instruments, settles into a gait and gathers momentum that halts mid-song with a single note from Oster that dissipates into the sonic ether. “Velvet and Smoke” is a good way to describe the brushed beat and the lustrous, collectively spacious sound created from Sirota’s sensitive production. And lastly, “The Pink City” isn’t free jazz, but everyone plays just as freely, not bound to any time signature and Oster cutting loose on a flurry of notes to put an exclamation point on his improvising. Thanks to Ruslan Sirota’s lush but not overly slick production that does a terrific job at separation, Reach passes the headphone test with flying colors. Consequentially, it becomes even easier to appreciate the chilled aura of Jeff Oster’s art. Order your copy of Reach from Bandcamp. Just finished my first run through of Jeff Oster’s new album “Reach” and it is a jewel. Smooth as silk and filled with rich soundscapes vibrating with Jeff’s signature chilled out horn playing. It was like spending some time at a late night music club with a jazz band that plies you all night long with some serious laid back grooves. You have outdone yourself my friend. For everyone else out there the album is due out officially on October 5 and you would do yourself a huge favor to preorder yourself a copy because you are definitely going to enjoy what Jeff has in store for you. Now to set this bad boy to repeat and just zone out. I confess I”m already a fan of Jeff’s music and his wonderful work as a ‘side man’ in various SF Bay Area projects, but this record just knocks my socks off. It is really exquisite; quiet, introspective and with more than a touch of melancholy. Just like some of the classic early ECM releases, it has a spacious feel, but unlike the northern ‘icy’ vibe of those releases, this record has tremendous warmth. It’s all down to not only Jeff’s writing, but also to the beautiful tone he creates on Trumpet and Flugelhorn. You know, the great horn players from Louis to Miles to Hubbard to Baker always had beautiful tone and I can say, unequivocally, that the sound of Jeff’s horn is nothing short of beautiful. The trumpet can be a very linear sounding instrument but never in Jeff’s case. Not to be too synaesthetic but It feels like I’m listening to liquid sculpture when I hear his playing. He mixes wonderful technique and, for lack of a better word, ‘chops’ but they NEVER intrude. This is a wonderful recording. Buy it and support physical medium and artistry! Jeff’s new release doesn’t officially come out until later in 2018 (October), so there won’t be sample links until he tells me it’s gone live… in the meantime, though, I can tell you that you’re going to fall in love with his 5:27 aural sketch of the “Five Great Mountains” (in China)… he’s joined by stellar players (I would expect nothing less) who help to invoke the attitude of worship this song brings to your consciousness.. Ruslan Sirota – keyboards, vocals; Robin Ghosh – guitar; Benjamin Shepherd – bass; Tamir Barzilay – drums; Pete Korpela – percussion; Jenni Asher – Erhu; Ravichandra Kulur – indian flutes and Drew Allsbrook – vocals – the percussion on this piece helps to set the mood for your journey to inspiration, and Jeff’s horn leads the way.